To me, it sounds kind of pretty and exotic... Do you think? 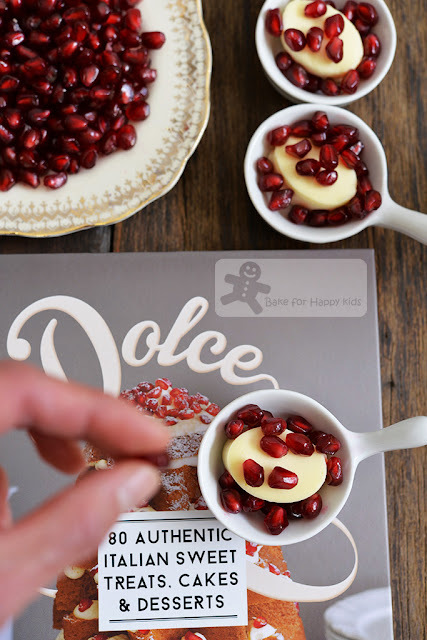 I'm happy that I have discovered these exotic Mediterranean flavours from these miniature pomegranate and orange flower panna cotta. 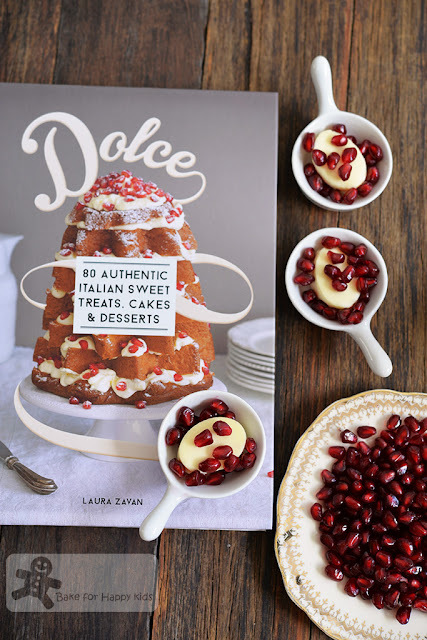 And they are made from a newly published Italian cakes and desserts book, Dolce by Laura Zavan. Food writer and blogger Laura Zavan was born in Treviso, near Venice has written several books including Little Italy and Venice: Cult Recipes, runs cooking classes and writes a lot for magazines and newspapers. 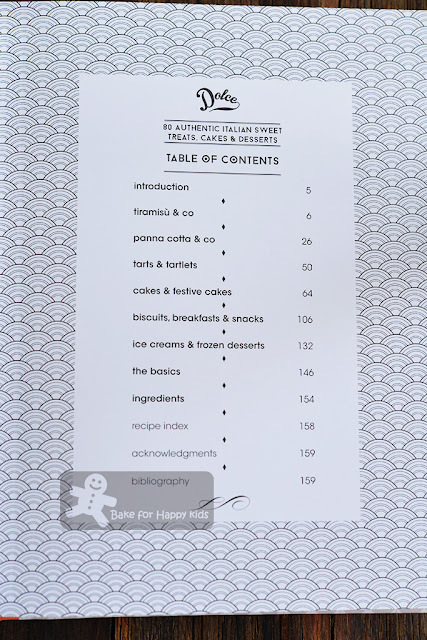 For this desserts and cakes book, she has showcased many traditional classics, regional specialties and also transforms classic Italian ingredients into whimsical creation. Just content page itself, you can see that there is lots of Italian sweet recipes in this book. Tiramisu and Co? Panna cotta and Co? It means that there will be a classic slash (/) basic Tiramisu and panna cotta recipe in this book, then followed by a numbers of spin-offs from these Italian classics. For example, the very first recipe of this book showcases the "official" Tiramisu from Treviso, a region of Veneto where tiramisu was born, then followed by 8 more different Tiramisu recipes that make several fruity varieties and also one super quick one. Super quick tiramisu? Yeah. The recipe promises that the tiramisu can be ready after chilling it in a freezer in 30 mins. Sounds good! 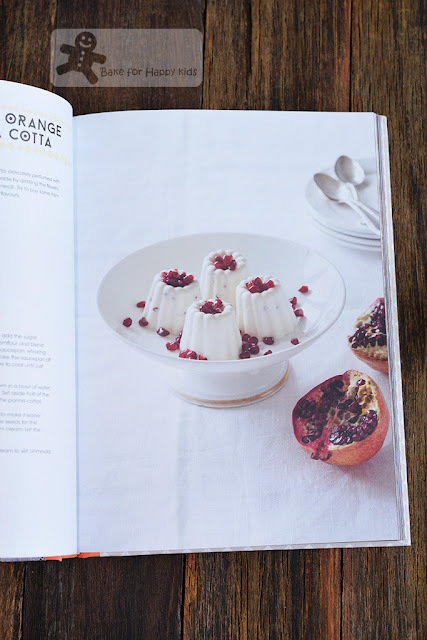 Let's see the book a little further by beginning with the chapter, Panna cotta and Co.
You know... 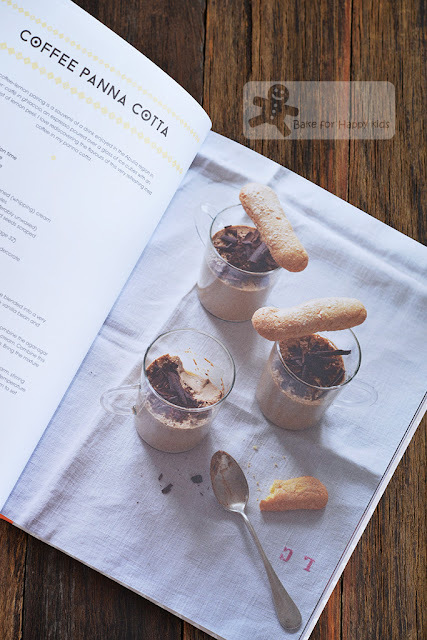 This basic Italian vanilla panna cotta recipe uses an Asian ingredient, agar agar!!! For me, I have chosen to make these pomengrante and orange flower panna cotta. What is orange blossom water? According to Wikipedia, orange flower water or orange blossom water is the clear, perfumed by-product of the distillation of fresh bitter-orange blossoms for their essential oil and has has been used as aromatizer in many Mediterranean traditional dessert dishes. 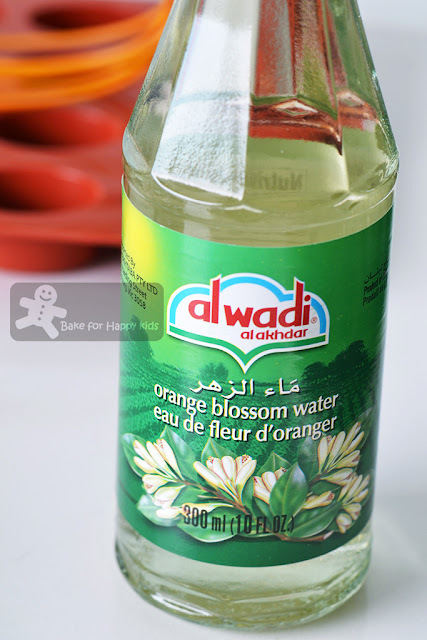 This is the orange blossom water that I used. 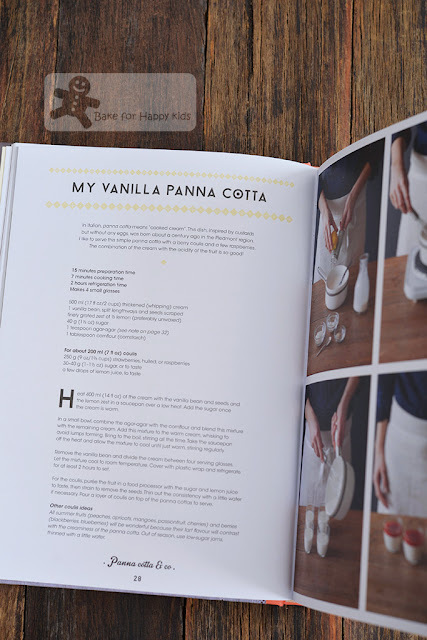 All the panna cotta in this book use cornflour and agar agar as their gelling agents! Why is the Asian agar agar used to make these Italian desserts? The author explains that she prefers to use agar agar and cornflour because they are plant based setting agents and can create a smoother panna cotta texture. 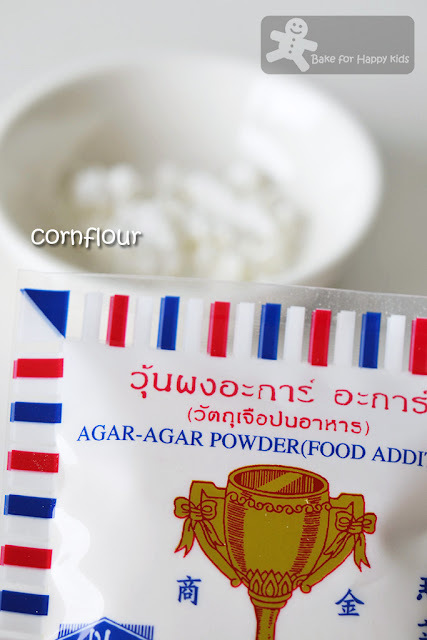 You can find and buy agar agar powder in most health shops or Asian grocery shops and if you can't use agar agar / cornflour mixture to make your panna cotta, you can replace 1 tsp agar agar and 1 tbsp cornflour mixture with 4-5g gelatine (which is an animal product) for every 500ml of cream used. Heat the cream over low heat. Add the cornflour mixture into the cream mixture. 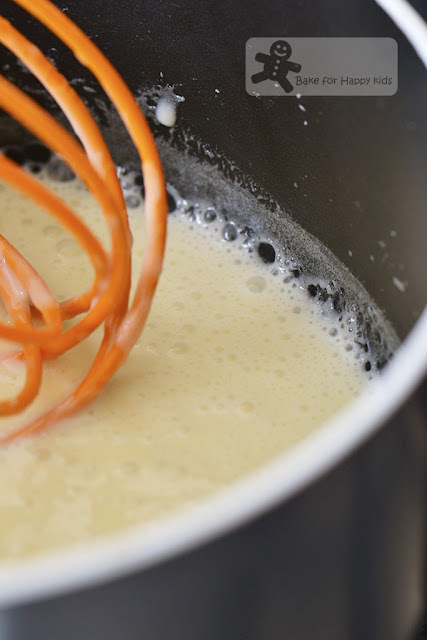 Whisk to combine both mixture. Keep whisking to avoid lumps forming. Bring mixture to boil and whisk continuously. Remove the saucepan from the heat and add orange flower water and allow mixture to cool until just warm, stirring regularly. 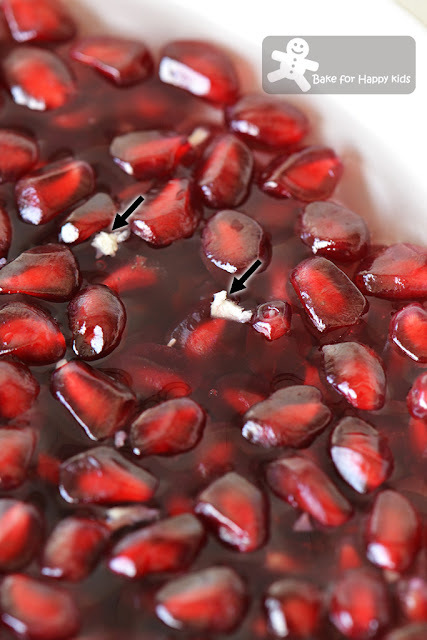 While the mixture is cooling, I took the seeds out of the pomegranate. 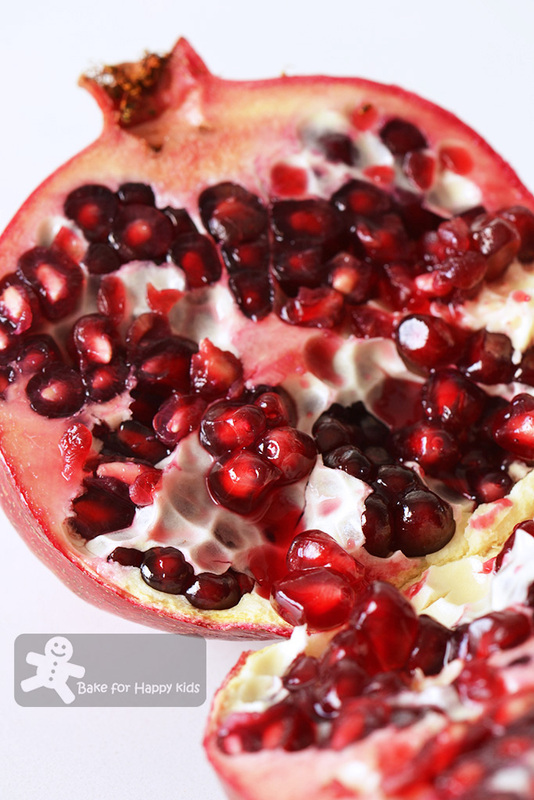 First, I cut the pomegranate into quarters. Remove seeds and soak them in a bowl of water. The white hard-to-remove membrane (see the black arrows in the above pic) will rise to the surface. To ensure that the panna cotta can be easily unmould, rinse individual moulds with water for about 2-3 times and use them immediately without wiping them dry. 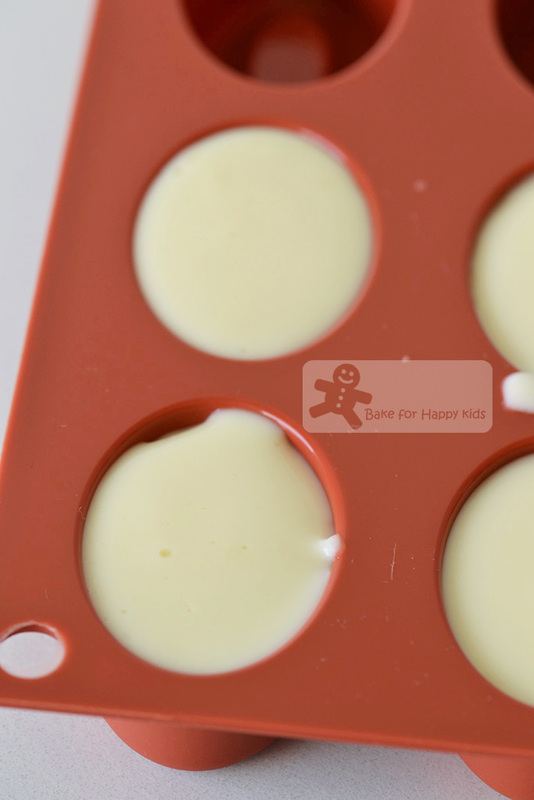 or 2) fill the moulds with lukewarm cream and use 1/4-1/2 of the seeds to decorate the panna cotta. 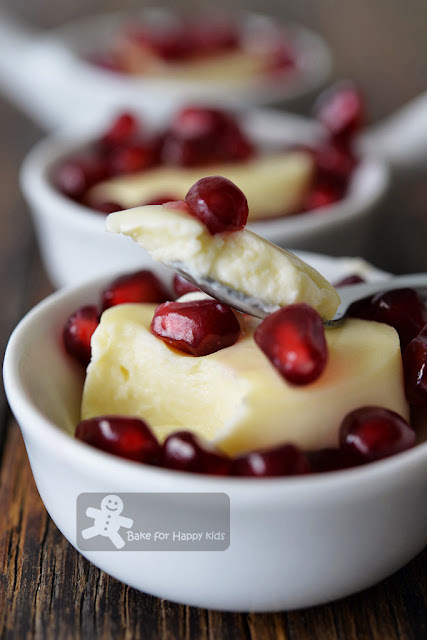 I prefer the velvety smooth texture of the panna cotta without biting the hard bits of the pomegranate seeds and so I fill my really small silicon moulds with just the cream mixture. Let the mixture cool to room temperature. 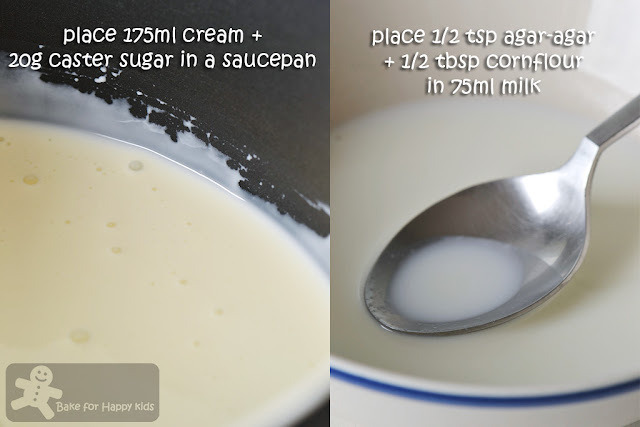 Refrigerate for 2-4 hrs or overnight for the cream to set. Unmould and decorate with more pomegranate seeds. These panna cotta are so mildly sweet, fragrant, velvety smooth and beautiful! "Mum, these cold and creamy jellies are so yummy!!!" My son was happy after sucking-in 2 to 3 of these little one-mouthful-size panna cotta all at one go. 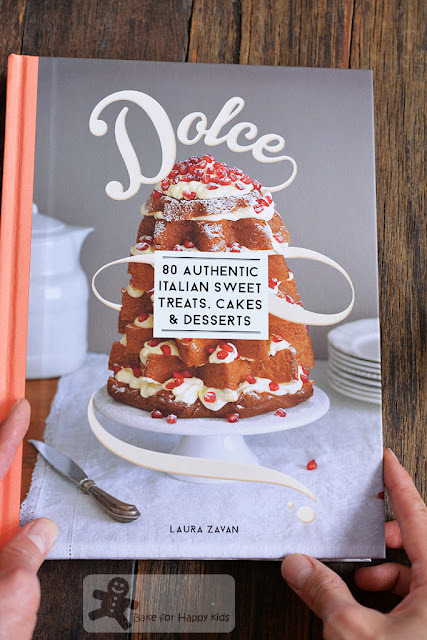 If you like making and baking Italian desserts and cakes at home and really like this book, you may wish to know this book is available now in most retail or online book shops at the retail price of AUD$49.99. If you like making and baking Italian desserts and cakes and want to see more recipes from this book, please stay tune for my next book review post. Happy Cooking and please enjoy these desserts. Hi Zoe! Gong Xi Fa Cai! This panna cota sounds so exotic and lovely. I had a good laugh reading your previous post where your husband kept saying "got standard" LOL! Well, of course lah got standard. You can bake and make pau so well! Hello, Zoe. I too want those cold, creamy jellies! Happy CNY to you and family! Very lovely results (but if I visit you....)I need them in larger portions...at least my serving! Nice to have you on board at Cookbook Countdown with Joyce and me! Indeed, using orange flower water, it makes this lovely creamy panna cotta sounds so exotic. Thanks for sharing! Your panna cotta looks very yummy! Very pretty dessert with the ruby pomegranates! This books sounds good! Thanks for linking with CC! I will have to look for the orange water. ALl I've been able to find is rose water. Those panna cotta are beautiful.